Content and Over-The-Top services are two of the areas, where operators can still provide value and improve their diminished margins. In this whitepaper we demonstrate how operators are uniquely positioned to leverage the power of their authenticated subscribers, enabling themselves as trusted partners to premium content producers. A huge number of learnt and insightful publications exist about the nature of online networks and communities, their structure and user behaviour. However, there seems to be a lot of uncertainty about the right practical (technical) approach when it comes to building and maintaining online communities. The choice of technical solutions sometimes seems overwhelming. i2i have set out to create an overview of the currently available technologies and how they can be employed by brands or other organizations to set up their own, closed communities. We filtered through more than 50 platforms, out of which this whitepaper examines 17 in detail, providing practical guidance through the maze of features and specifications. Focus is on those technologies that are fit to run closed social communities, i.e. communities that want to stay in control over who joins and what content is being published. Ning, PHPFox, SocialGo, Spruz, Wall.fm/Oxwall.fm and Woosp. 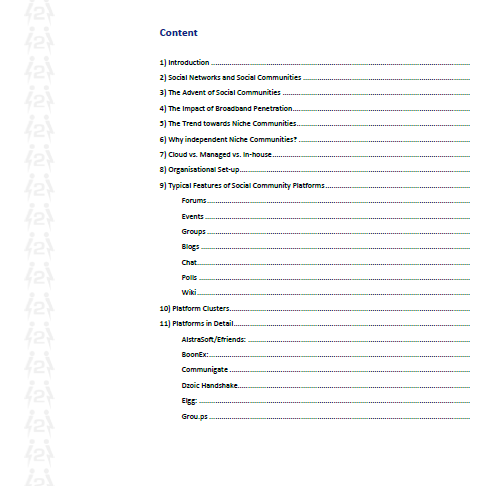 This whitepaper is for those, who prefer their own, closed community, to using one of the mega platforms like Facebook. Closed communities ensure that the community stays in control of the community members’ private data. Especially in times of wiretapping and unlimited spying, many communities will want a certain minimum of privacy for their members. Order your copy of this whitepaper now! 499.00 Euros that will save you lots of time and work!